Water soluble and small molecule β-glucans – mostly cereal derived: oat, rye, barley, etc. Insoluble and large molecule β-glucans – mostly mushroom derived (yeast, shiitake, schizophyllum, reishi, etc. 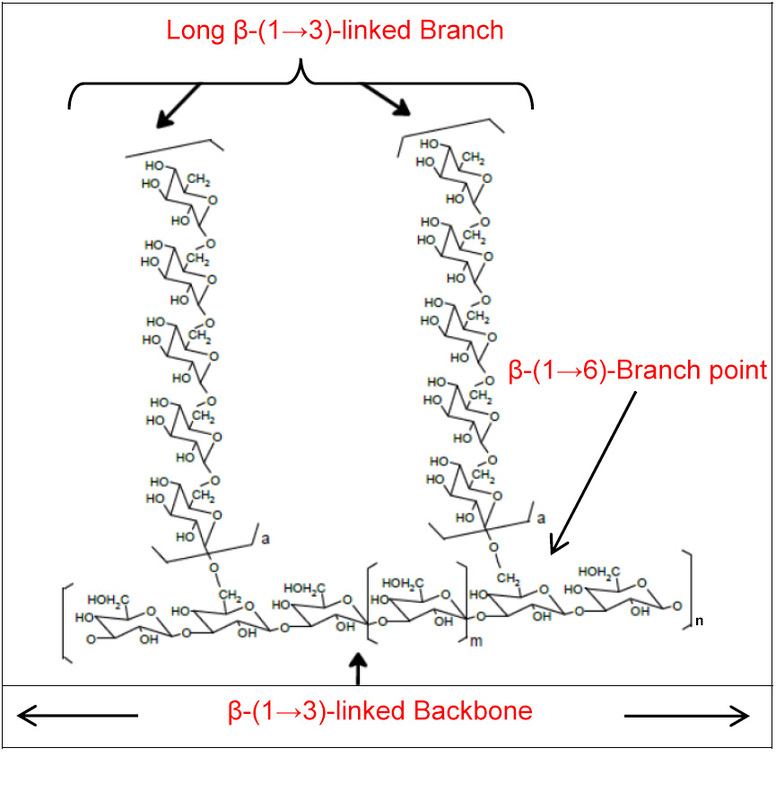 Uptake of large-molecule, insolouble β-glucan has been shown in mice with soluble and particulate yeast (1,3)-(1,6)-glucans labeled with fluorescein. 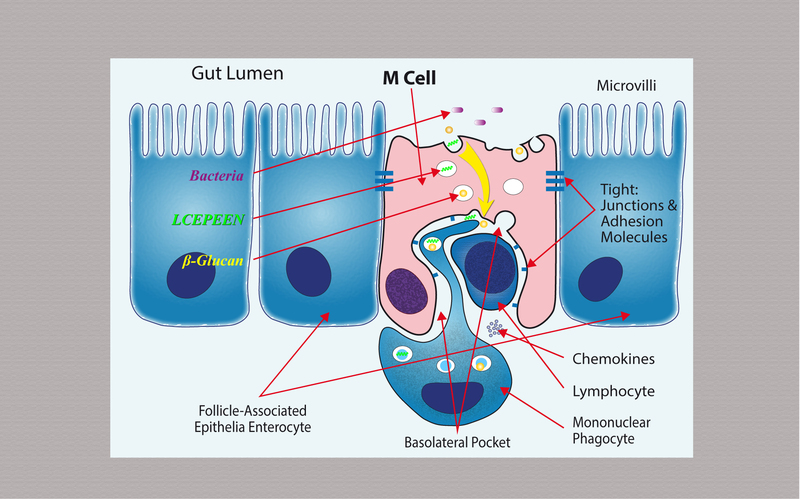 Both types of yeast β-1,3-glucans were taken up by gastrointestinal macrophages via so called M-cells. Peyer's Patches are covered by a tissue that contains specialized cells called microfold cells (M cells). 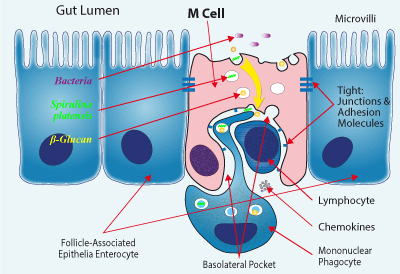 M cells have the unique ability to transport organisms and particles from the intestine to immune cells located in a pocket-like structure underneath. Those immune cells are macrophages, lymphocytes (T cells and M cells) and dendritic cells, which receives the antigens and delivers them to the other immune cells. These cells then moves to the lymph nodes where the immune response is amplified. The activated cells were also transported to the spleen and bone marrow. 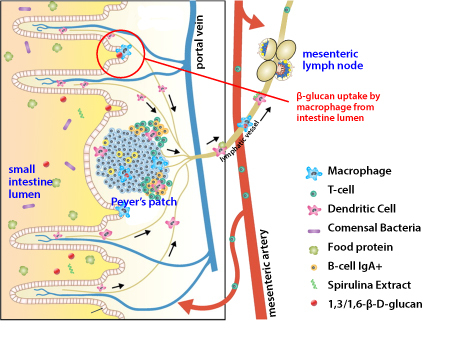 Also, in vitro experiments have shown that β-glucans were degraded inside macrophages and released into the culture medium, which makes them eventually available for the circulating system and a systemic distribution. In general, humans cannot synthesize β-glucans. Therefore, the immune system recognizes these compounds as foreign. The innate immune system responds to invading pathogens through pattern recognition receptors (PRR), which are typically expressed by immune cells but also by other cells. PRRs recognize conserved microbial structures, the so-called microbe-associated molecular patterns (MAMPs), formally called PAMPs. β-glucans are considered as one of the major MAMPs for the PRR-mediated sensing of fungal infection. 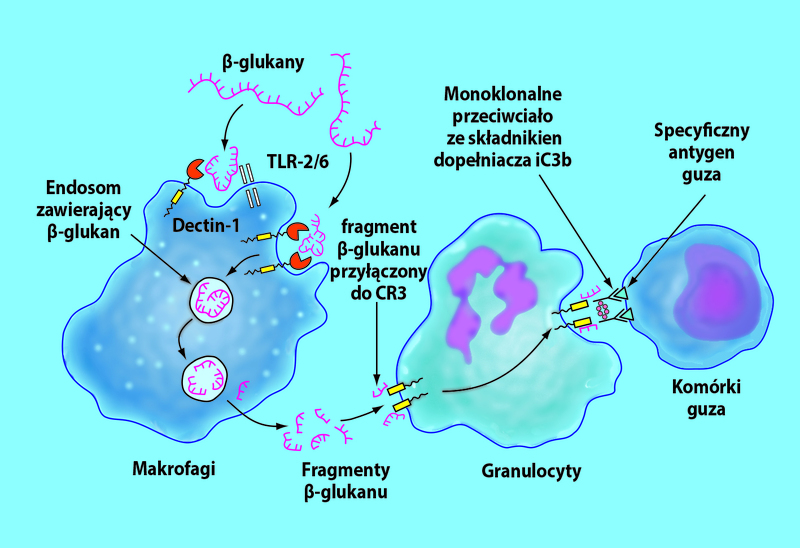 So far, the most important PRRs for β-glucans are the dectin-1 receptor, the complement receptor 3 (CR3) and toll-like-receptors (TLR), which are found on various immune cells such as monocytes, macrophages, dendritic cells, neutrophils, eosinophils, and natural killer cells, but also on intestinal epithelial cells. Binding of β-glucans to dectin-1 induced a cascade of innate and adaptive immune response such as phagocytosis, oxidative burst, and the production of cytokines and chemokines in dentritic cells and macrophages. Kankkunen et al. showed that particulate yeast β-glucan triggered interleukin-1β (IL-1β) mediated cellular response in human primary macrophages via dectin-1 signaling. Earlier in vitro studies showed that yeast β-glucan is a strong stimulant of macrophages and induced mitogenic activity in rat thymocytes, indicating immunostimulatory effects. Many investigations on the immunomodulatory effects of β-glucans were performed using parenteral applications. In the meantime, those effects have also been shown for orally applied β-glucans. Therefore immune stimulating effects may be achieved by dietary intake of yeast β-glucans. However, not all β-glucan preparations have the potential to stimulate these reactions. 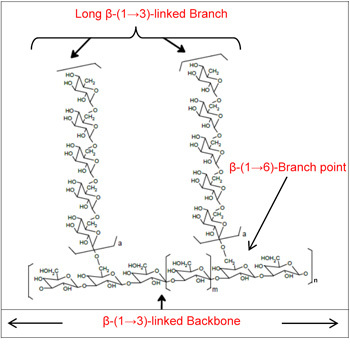 In order to be able to activate the dectin-1 receptor cascade, β-glucans must comply with specific structural properties. It seems that insoluble, particulate (1,3)-β-glucans with 1,6-β-branches are able to activate this cascade, while soluble ones activate the antibody-mediated complement system via the CR3 receptor. Clinical trials performed with dietary insoluble particulate β-glucans have demonstrated positive effects on the immune system. Therapeutic efficacy results for orally applied soluble yeast β-glucans are not yet available. So far, this has only been shown for the insoluble fraction. All the performed human clinical trials demonstrated that intake of β-glucans is very well tolerated. Based on the clinical trials presented in this review, an increased intake of dietary β-glucans might help to improve immune functions. Numerous clinical studies and evaluation regarding β-glucan properties have been performed. They clearly have shown that administartion of 1,3-1,6-β-D-glucan significantly reduces risk of infection and infection releated comlications in various clinical situations. (read more → Immuno-Modulatory Effect of Yeast β-glucan) pdf file, 12 pages. If you have not found the answer you are looking for, please fill in this contact form and send it to our expert! Question* Choose a questionAre there any contraindications or limitations for Immulina?In what kind of situation Immulina is recommended?How long could I use Immulina?Where could I buy Immulina?What is the optimal Immulina dosage in my specific situation?Is there any sales promotion of Immulina and how can I get it?Why Immulina is the best chose in immune boost?If any other subject not specified above – please write in the frame below. By ticking this checkbox I hereby agree for processing of my personal data contained in this contact form and to receive an answer to my inquiry by electronic mail by the Administrator i.e. Phytomedica Poland Co. Ltd. Krolowej Marysienki Street 9 Apt. 2, 02-954 Warsaw, Poland. Before sending the form, make sure the email address you typed is correct! Immuline Plus provides spirulina extract, yeast extract, acerola extract and zinc ions. Supports immmune health. Fast recovery with Immulina Plus.